The cleric has a lot of difficulty leveling solo. 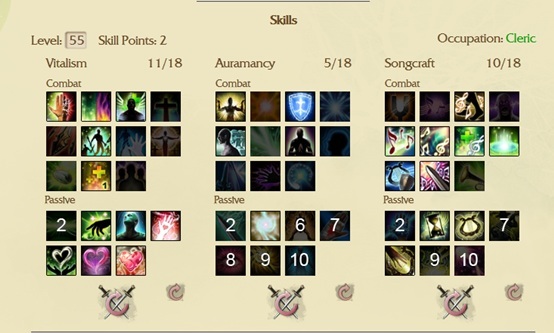 We need a team mate to have efficient leveling and we can always add Critical Discord and some other Songcraft skills to your build to help damage. To be a great healer in the group, the most important two factors are controlling mana and healing.How to make your characters being a main healer? Any players using Vitalism along with Auramance has the potential to do that. And, the professional healer Cleric involves Vitalism, Songcraft and Auramancy three skillsets. Spirit: Is converted to Healing Power. Mana Regenerate: The ability to regenerate mana which only happens when you aren’t casting. When you are using a skill, it generates a 5 second cooldown after which your mana regenerate will start again. Mirror Light: It is great skill to control the battlefield which cures debuff. As long as you are in the combat, the healer should cast this skill for main Tank which can significantly improve healing effectiveness. Rhythmic Renewal: Before the battle started with Boss, please cast Rhythmic Renewal on the most possible fight place and the least to lose life. The former aims to serve consider MT, and the later aims to serve long distance player. This skill has60 seconds duration, after you cast it, you can recover full mana within 10 seconds. Resurgence: is a healing over time (HoT) instant spell,but it lack of critical healing effect. So, we need to use Antithesls when need a mass of life health. Antithesis: This skill is a single target heal with a cast time. It can be converted to an instant cast skill while under Conversion Shield. Max range 25m. Fervent Healing is an instant single target healing spell. The spell needs to physically reach the target before it will affect it. It can be casted 5 times consecutively before the cooldown is triggered. Max range 30m. Meditate: Last but not least, the amazing skill Meditate to recover mana.When your mana reduce 1/3 mana you should take time to use it, especially when the boss was stoned you should consider using it.